8vo. 11. “The History of Ireland, vol*. 1.” 1763, 4to. He published no more of this, being discouraged by a disappointment in his expectations of some parliamentary assistance. 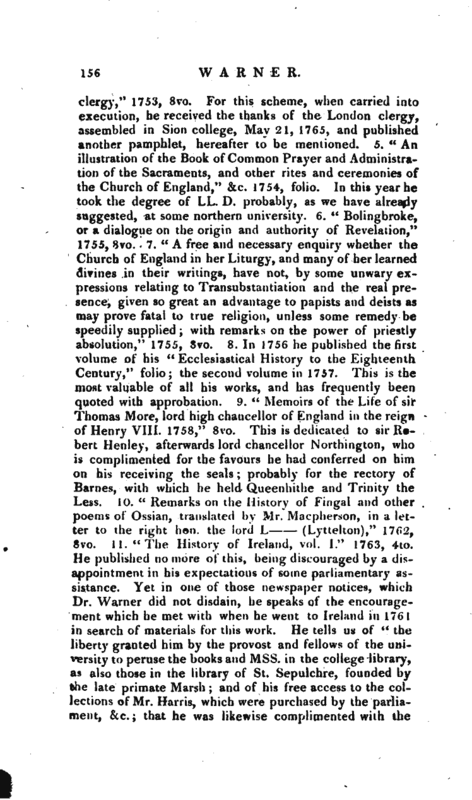 Yet in one of those newspaper notices, which Dr. Warner did not disdain, he speaks of the encouragement which he met with when he went to Ireland in 1761 in search of materials for this work. 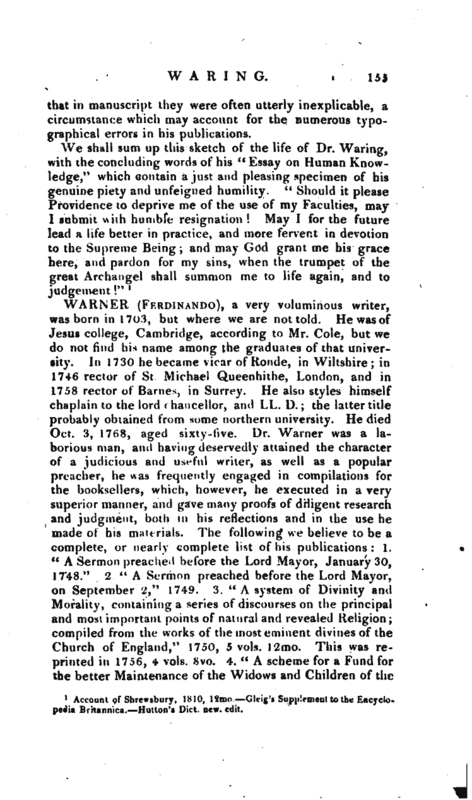 He tells us of “the liberty granted him by the provost and fellows of the university to peruse the books and Mss. 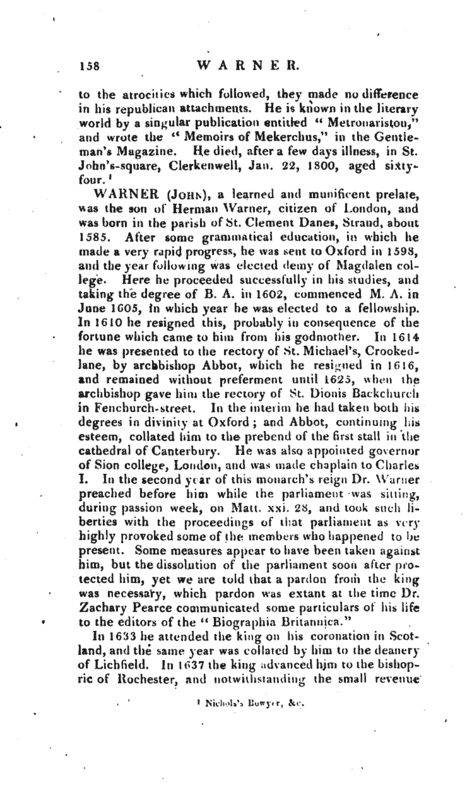 in the college library, as also those in the library of St. Sepulchre, founded by the late primate Marsh; and of his free access to the collections of Mr. Harris, which were purchased by the parliament, &c. that he was likewise complimented with the | liberty of searching the records of the privy council, and other offices, &c.” 12. “A letter to the fellows of Sion college, and to all the clergy within the bills of mortality, and in the county of Middlesex, humbly proposing their forming themselves into a Society for the Maintenance of the Widows and Orphans of such Clergymen. To which is added, a sketch of some Rules and Orders suitable to that purpose,” 1765, 8vo. 13. “The History of the Rehellion and Civil War in Ireland,” 1767, 4to. 14. “A full and plain account of the Gout, whence will be clearly seen the folly or the baseness of all pretenders to the cure of it, in which every thing material by the best writers on that subject is taken notice of, and accompanied with some new and important instructions for its relief, which the author’s experience in the gout above thirty years hath induced him to impart.” This was the most unfortunate of all his publications, for soon after imparting his cure for the gout he died of the disorder, and destroyed the credit of his system. 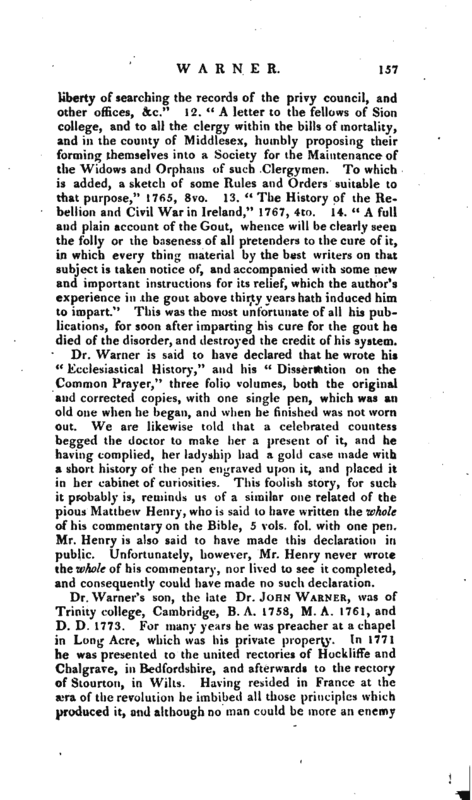 Dr. Warner is said to have declared that he wrote his “Ecclesiastical History,” and his “Dissertation on the Common Prayer,” three folio volumes, both the original and corrected copies, with one single pen, which was an old one when he began, and when he finished was not worn out. We are likewise told that a celebrated countess begged the doctor to make her a present of it, and he having complied, her ladyship had a gold case made with a short history of the pen engraved upon it, and placed it in her cabinet of curiosities. This foolish story, for such it probably is, reminds us of a similar one related of the pious Matthew Henry, who is said to have written the whole of his commentary on the Bible, 5 vols. fol. with one pen. Mr. Henry is also said to have made this declaration in public. Unfortunately, however, Mr. Henry never wrote the whole of his commentary, nor lived to see it completed, and consequently could have made no such declaration.